We deep dive into the growing world of crowdfunded wearable technologies, especially within the audio space, and talk about our success helping get Waverly Labs raise record-breaking funding through crowdfunding. We are Beast Enterprises, management consulting firm, a team of MBAs, investment bankers, designers, management consultants, and more importantly, builders. We started back in 2015 to help early stage ventures grow by providing a mix of service and investment focusing on strategy and capital raising. Our partners, both clients and investments, have raised north of $22 million through traditional institutional VC and crowdfunding. We have been immersed in the crowdfunding space, both rewards and equity based and find the trend fascinating. This brought us to this research. Anyone who has a smartphone, has also headphones, earbuds, earpieces, earpods, earphones - it goes by many names, and this accessory has been a crucial piece of our lives. At Beast, we use Sennheiser PXC 550, Bose QC 35, and wired iPhone headphones that we get for free - which are very different: first two are wireless noise cancelling ear covering headphones costing $450 and the latter is almost the complete opposite costing $10. Both are great options. 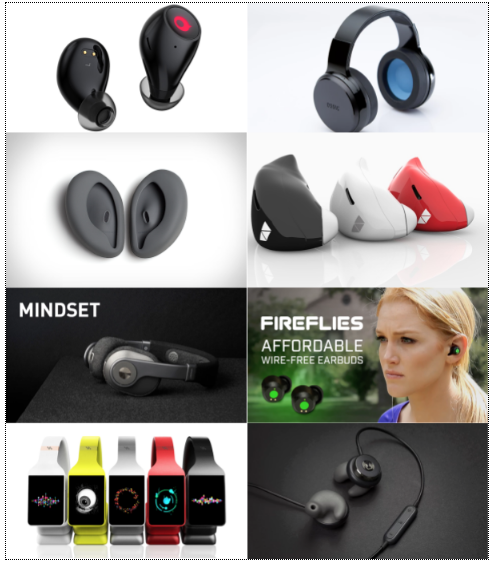 As crowdfunding experts, we decided to consider (the archives of) Kickstarter (founded 2009) and Indiegogo (2008) to understand the innovation in the headphones space. 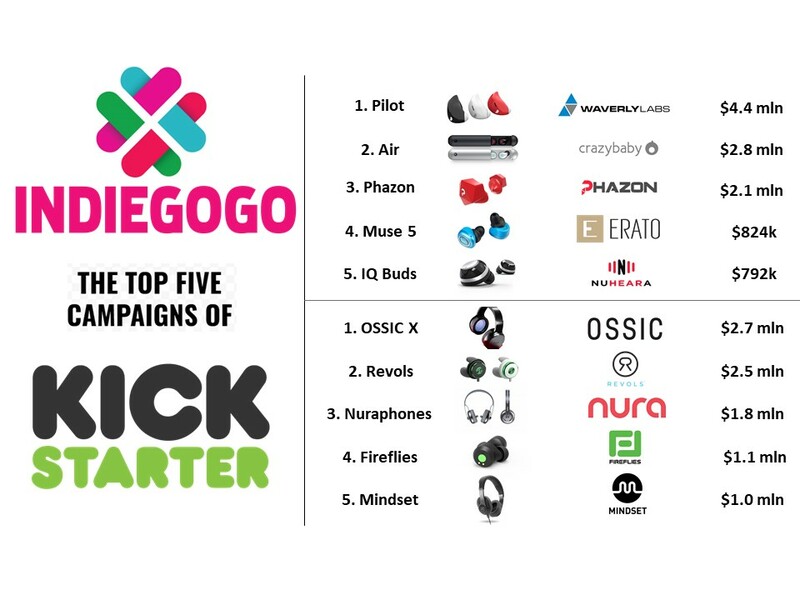 We search for several relevant keywords such as “headphones” on most successful rewards based crowdfunding platforms, Indiegogo and Kickstarter. We collected and organized all relevant information, dated January 2016-July 2017, separated Backed (projects based but some failed) from Raised (actually raised money), converted currencies into USD, and synthesized both platforms in this spreadsheet. There were a total of 192 campaigns, 107 on Kickstarter and 85 on Indiegogo with a total raise of $31.9 million, $16.1 million on Kickstarter and $15.8 million on Indiegogo. 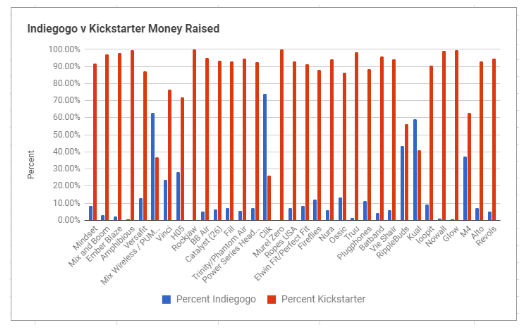 Out of 107 Kickstarter projects, 42, or 39%, were either unsuccessful or canceled, while 31 out of 85 Indiegogo projects, or 36%, are in-demand. MSRP is the average amount each backer spent to help the campaign. Those in parenthesis are official prices on the websites for the products, with, if applicable, website price the “preorder discounted price”. With nearly every price being at or above the crowdfunding backing, it confirms that there is, in the end still a rewards and donation based incentive behind crowdfunding. Interestingly, for those who raised on both platforms Kickstarter was overwhelmingly the platform that had more success in money raised for the same product. Some Trends - or Not? 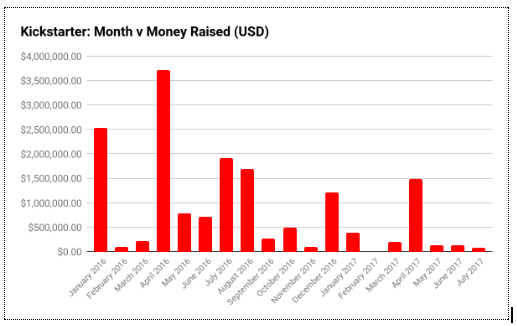 There seems to be no relation between the time of year and money raised, and instead more based on the effectiveness of the campaigns themselves. Cheers towards meritocracy and well-structured projects. The case of Danish H05 headphones or an Indiegogo Mistake? In the case of one project, the H05 Smart Headband for the TMA-2 Headphones, the project raised over 1 million Danish Kroner on Kickstarter. This project also raised money on Indiegogo, but when mentioning the money raised, the 1 million kroner was displayed as dollars - over $800,000 of difference in value due to the confusion. One campaign that was interesting is the Ximalaya headphone campaign on Indiegogo, which raised more than 2 million dollars, with more than 1.8 million from another platform - one that wasn’t Kickstarter. There were some interesting things about it, and the backers were incredible frustrated that the product had not arrived yet. Some discovered a similar product on Chinese Marketplaces, under a different name, the Himalaya. After tracking back the product, and due to the Danish Kroner mixup we decided to investigate to see if Indiegogo had made an error. As it turns out, the company had indeed raised the stated amount of money, except on Taobao’s crowdfunding platform, and under Himalaya.  The company phonetically translated the product to Ximalaya for Indiegogo, and had shipped the product first to Chinese consumers. In the case of campaigns that used both Indiegogo and Kickstarter, some decided not to sync both campaigns and run separate campaigns, sometimes under different names. In these cases, the names would often be similar, just the headings would differ. The main difference - despite running two campaigns, they wouldn’t be synced. 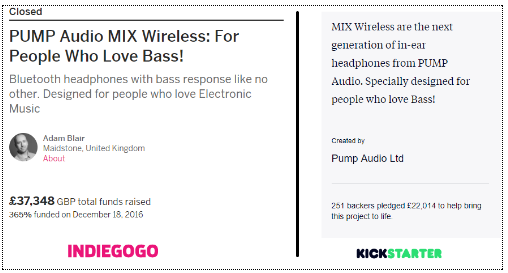 One example is the PUMP Audio Mix Wireless campaign, which did not designate their successes on both. Overall the strategy is successful, as noted below Indiegogo only allows fundraising after a campaign has successfully ended. This is a method to have more exposure and double the chance of getting funded. 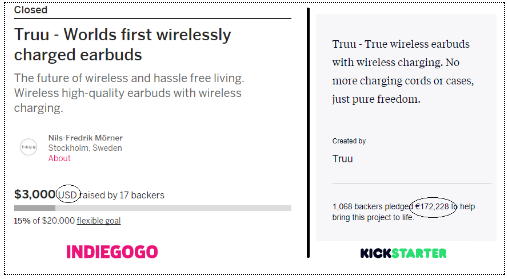 Other campaigns changed the locations of the campaign between the two, and also requested the money to be raised in different currencies (for example, GBP and USD) Some examples include Truu, which raised in USD and Euros, while others changed the location such as Vinci, which was located in San Francisco in Kickstarter while New York on Indiegogo. To check the amount raised, they see the amount publicly displayed on the other platform and use that as the goal. 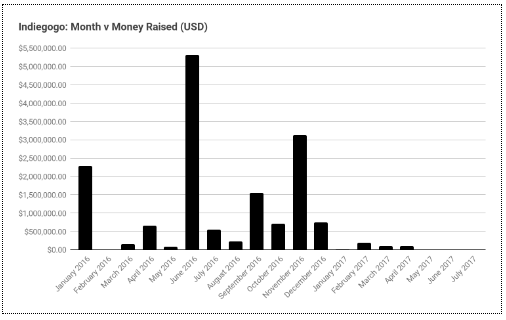 There were also some campaigns that were interesting that demonstrated how crowdfunding’s implications for niche products also still was a major part of funds raised. Among these projects included earbuds made from used bullet shells and a line of earbud-necklace hybrids that were made by a jewelry company to combine fashion and practicality. So what did we find out through this research? For starters, Apple Airpods definitely do not represent where innovation is going. Innovation is headed in all directions. To increase comfort - smaller and custom fit. To increase functionality - real time translation, wireless charging, and waterproofing. To be better at what they do - noise cancellation, bass amplification, being “smart”. And along the way we’ve learned a great amount about Indiegogo, Kickstarter, how successful campaigns work, and how they don’t work. After all, we were surprised by what happened to Pebble (2009), a smartwatch company that Kickstarted 3 record breaking times more than $10 mln, $20 mln, and $10mln each time, also raised $15 mln from professional Venture Capital firm, but then acquired in 2016 by Fitbit for just $23 million. While successful crowdfunding does mean fundable traction, it does not always lead to a successful company. Some questions after our research are examining the ins and outs - what makes a good campaign. And does a successful campaign create a company, or is it a one hit wonder. Do they move to equity crowdfunding or go back to traditional VC? We’ll dive in and figure out the answers.